Watch the latest Racing Apex trailer. Captured at 60 Frames Per Second on PC. Also added information on the game features and modes. Here is the latest Racing Apex Trailer. Captured at 60FPS on PC. Arcade style handling that is easy to pickup for beginners but challenging enough for racers who want to master the tracks. Choose your champion! Each racer has their own unique vehicle selection that suits their driving style. All drivers fall into different weight classes, light, medium or heavy. Lower weight classes have better acceleration and quicker handling. Heavy class drivers have higher top speeds and more weight. Find the best combination of driver and vehicle to suit you! Choose from over 30 vehicles that can be fully modified and show the scars of battle on the track. Each vehicle also has four unique modes - Standard, Pro Race (for maximum handling), Speed (for Dragster/Top Fuel levels of speed) and Rally (for maximum strength). The vehicle list is expanding all the time, let us know if you have a favourite vehicle you would like to see in the Racing Apex world! Race under bright blue skies across the globe. 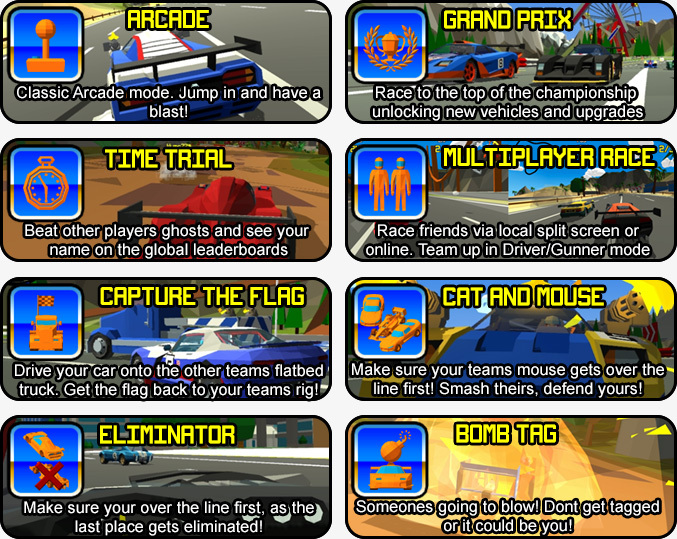 Each colorful region contains multiple track configurations for racing and arena style battles. Currently 16 different tracks are available with more being added. An arsenal of offensive and defensive items are available on track to take out your opponents. There is also the option to race with no weapons or items if you wish. Online global and national leaderboards show the worlds greatest racers. Get your name to No.1! The next update will detail the drivers backgrounds and the vehicles they use. Get ready racers! My name is Michael and I have 27 years. I am Brazilian. And promoter of new games. I have a channel on youtube with 1450 enrolled and average of 7000 monthly views. I've been following the game Racing Apex in indieDB and want to help you spread.